Little more than a large rock, Montecristo is an island situated in the centre of the Tyrrhenian Sea, not all that far from the more well-known islands of Elba (43km) and Argentario (64km). A desolate island, which has been almost completely untouched by man, Montecristo has a coastline stretching for 16km that is, with only one exception, totally inaccessible. The island is culminated with a great peak of 645 metres. Yet its minuscule land mass is home to many legends and a history that is truly unique including a fabulous treasure that is hidden on the island. Over the course of the centuries, there have been many attempts to retrieve this treasure, none of which have resulted in success. However there is one exception. The legend of the famous “Count of Montecristo”, a novel written by Dumas, tells of this one successful attempt which started right back in the 10th century A.D. The glorious Western Roman Empire was by then just a distant memory, and the western Mediterranean became the scene of raids carried out by the Huns who had founded a kingdom on the coast of Africa. Not content with their African realm, they began a quest to conquer Rome itself, on the way passing both Corsica and Sardinia and occupying Sicily. Known for their fierce agression, during their raids they harassed the Christian people intensely and their king, Genserice, took Mamiliano, the Bishop of Palermo hostage along with 4 of his faithful companions, taking them to Africa. However, the Lord, moved by the prayers of these five men, helped them to miraculously find a boat with which they could successfully escape. 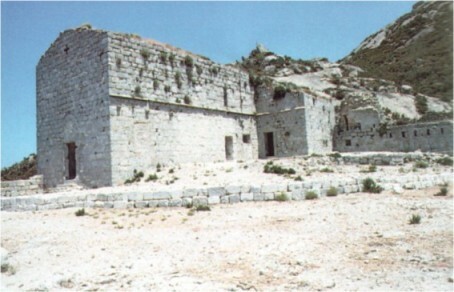 After a long pilgrimage between Sardinia and the Tuscan Islands, with a constant fear of being recaptured by the pirates and with a desire to conduct a life of prayer and meditation, they finally reached Montecristo Island, an island which was, even in ancient times, truly inhospitable and savage. On the summit of the island they constructed a temple dedicated to Zeus. Up until this point, the island had remained completely uninhabited, due to a terrible dragon that lived there which, blowing flames from its mouth, had kept all visitors far away. However, nothing frightened Mamiliano and he decided to establish himself on the island, managing to kill the monster by burning him and then throwing his remains into the sea. After that he destroyed every trace of Paganism on the island, even changing its old name of “Montegiove” to its present name of “Montecristo”. He then retreated into the solitude of a cave, which has since been transformed into a tomb. In the years following these events, the famous tale of Mamiliano circulated throughout the Tuscan Islands, and many islanders travelled up to the cave to visit the solitary saint in search of his blessing or his mercy. At this point, by then feeling as though he was close to the end, he began to confide in his visitors that a white cloud rising into the sky from the island would serve as a symbol of his death. His premonition did, in fact, happen and so at the signal the inhabitants of the neighbouring islands fled towards Montecristo, in a race to obtain the corpse of the Saint.However, it was the inhabitants of Giglio Island, with the help of a miraculous storm which was released upon the other islands, who won the race and therefore had the honour of having custody of such a worshipped relic. Unfortunately, the remains of Saint Mamiliano were not destined to find peace for some time. Firstly, these precious relics were transported to Gaeta in Lazio centuries later in order to be kept safe from raids of Saracen pirates. Then, under the command of a Florentine priest, they were transported by sea in the direction of Florence. However, the boat that was carrying the body of Mamiliano, following a route up the river Arno, did not succeed, despite countless attempts, in going beyond the city of Pisa. On the contrary, it came to a halt in front of San Matteo church and did not move any further. It was therefore believed that this was clearly the wish of the Saint to be buried in that place, and so this is what they did. In honour of Mamiliano, a monastery was built on Montecristo Island that was blessed with great power and wealth, thus having a lot of jurisdiction over many other monasteries in Sardinia, Corsica and Tuscany. However, this came to an end in 1553, when the terrible Saracen pirates, ordered by the cruel Dragut, destroyed the monastery, slaughtered many of the inhabitants of the island and took the monks prisoner. Ever since, almost nobody has lived on the island and the legend of a fabulous treasure began (which was believed to consist of mostly chalices, sacred furniture and jewels such as gold and precious stones) that the monks must have hidden in a place where Dragut would never be able to find it. Consequently, a search was later put into action by either Cosimo I de’ Medici or the Prince of Piombino, Alessandro Appiani, and his wife Elisabetta which was unsuccessful. Not only that, according to information taken from a book written about their findings, in their quest to find the treasure all the actually succeeding in doing was destroying what little remains of the monastery. The only thing that they managed to find of this wonderful treasure, as far as we know, is the legendary Edmondo Dants, the “Count of Montecristo”, of Alessandro Dumas. And so, perhaps the real treasure is the island itself, with such beautiful, unspoilt nature, enviously protected within the boundaries of the Tuscan Islands Natural Park: Unattainable, like its mysteries. blogs I stumbleupon on a daily basis. It’s always exciting to read content from other writers and practice something from other websites. Hi there, I found your blog via Google while looking for a related topic, your site came up, it looks good. I have bookmarked it in my google bookmarks….